Playing their first game since the calendar flipped to December, the Seward County Saints looked like a new team Saturday night in the Greenhouse, building a 36-11 lead early on against visiting Coffeyville before holding on late thanks in large part to a huge night from sophomore Kevin Sims to win 89-82, earning their second Jayhawk Conference win of the year in front of their home crowd. Coffeyville jumped out to an early 6-4 lead three minutes into things, but the Saints came roaring back, scoring 14 straight and 19 of the next 20 in the game to open up a comfortable 23-7 lead on the Ravens. Seward didn’t stop there as Coffeyville scored the next four to make it 23-11 before another big Saints run, this one a 13-0 burst led by Kevin Sims and Micah Littlejohn to balloon their lead to 25 at 36-11 with 7:10 remaining in the half. Just when it looked like it was going to be the Saints night though, they went ice cold, finishing the half by making just one of nine field goal attempts, watching their once 25 point lead dwindle down to just eight before the break at 38-30. Both teams had no trouble putting the ball in the hole in the first 20 minutes as Coffeyville shot 52% and the Saints 50% including 7 of 15 from downtown. Sims led Seward with 13 first half points while Littlejohn added 10, no Red Raven scored in double figures in the period. The Saints came out of the locker room with the first four points of the second half, but again couldn’t find their rhythm after that as their 12 point advantage slowly slipped out of their hands until a Coffeyville three gave the Red Ravens their first lead since the opening minutes at 47-46 with 13:08 to go. The Saints moved the ball well on their next two possessions, each finishing with the ball going through the net to put them back in front and a pair of Malik Brown triples pushed the lead back to five at 60-55. 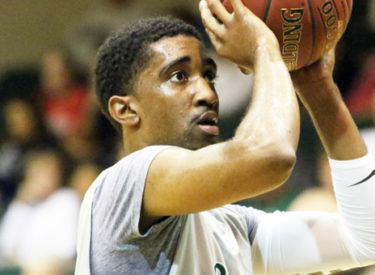 Sims owned the next three minutes, scoring eight straight for Seward as their lead grew to nine, but five straight from Coffeyville sliced the Saints lead down to just four at 71-67 with 6:12 left. A big finish in traffic from Martavious Wilson lengthened the Saints lead to six, but Coffeyville kept hanging around, making it a one possession game with a pair of free throws with 2:06 to go. With under a minute remaining and it still a three point game in favor of Seward, Sims came up big again, swishing home a step back three to put the Saints up six and that was it for the Ravens as Sims took care of business at the free throw line down the stretch to salt away an 89-82 victory to send the home folks to the parking lot happy. Sims had a career night for the Saints, scoring a game and career high 37, the 10th most points in a game by a Saint in school history, while Littlejohn chipped in 14 in the win. 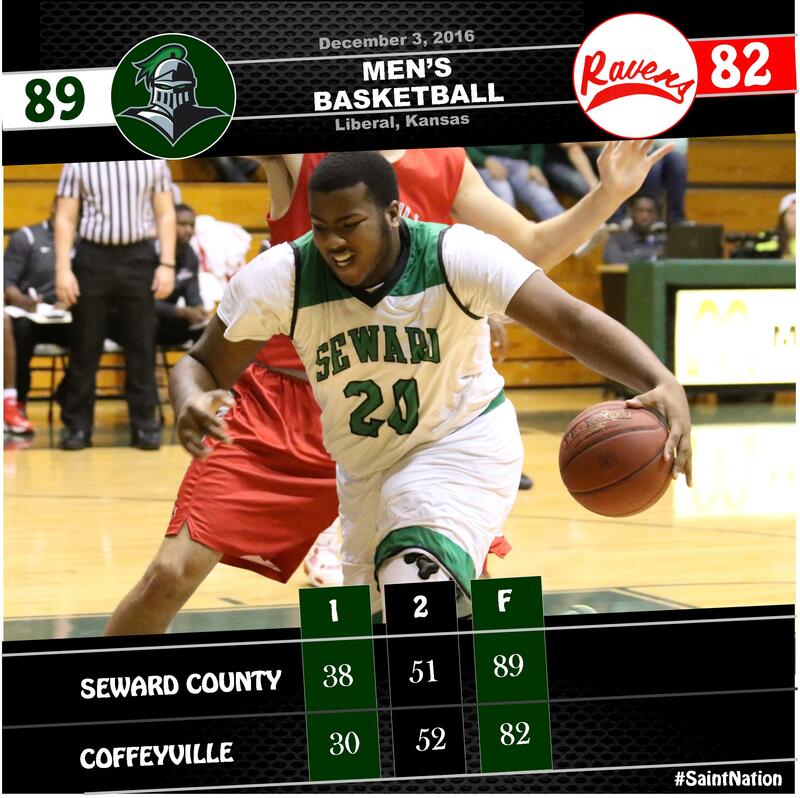 Seward shot exactly 50% in both halves while Coffeyville shot 56% in the second half to finish the game at 54% overall. Seward wins for the second time in three outs to improve to 5-6 overall and 2-5 in league action with the victory while Coffeyville falls to 8-3 overall and 4-3 in Jayhawk Conference play with the defeat. Next up for Seward is a trip to Iola on Wednesday when the Saints will take on the Allen Red Devils in a late tip in Southeast Kansas.